A television channel says ' Asli Maza To Sab Ke Saath Aata Hai ' ( Real fun is with everyone ). There are business outings and you go alone without family. Then in spite of having lots of spare time you better prefer to stay in your hotel room due to lack of enthusiasm and interests. But when you visit same place with the family having children around, you feel the environment much happier and livelier than when you were alone. Children bring that magical touch to any vacation, their enthusiasm and interests in things make you more excited about holidays planned with them. Today in this competitive world children are so much busy with their studies,tuition,dance classes,music classes,hobby classes,etc that they hardly get any time to cherish nature. I felt very bad one day when my nephew questioned me about how a full moon looks like. I realized that they stay so much occupied inside the four walls of the houses in the concrete jungle called city that they have never seen a full moon by sleeping outdoors. Perhaps they are also unaware of soothing summer morning breeze, floral gardens, birds chirping and things like that. They are not solely responsible for this situation. We never took out time from our busy schedules to spend quality time with them to discuss their desires. Conversations with them reveals their contentment in smaller things than we think like chasing a butterfly, making a tree house, watching wild animals in jungle, feeding fishes in ponds, spending time with family in camping and if we looked closely to this list these are also the things we want for ourselves. Children with their holiday plans live with dreams some of which are unfulfilled in our own lives and somewhere in our life we also wishes for these desires to come true. I have kids around me in the form of nephews and nieces and I would want them to experience these beauties of nature with the family in a holiday of their choice a #TravelWithKids. I would ensure such a place for them where they could feel nature close to them. Where they could cherish the beauty of high mountains and at the same time embellish the flowing fresh water of rivers under their feet. A place where they could fully enjoy their childhood and give us elders in the family to relive our childhood with them. I would make sure the freedom of their senses which they otherwise hide behind books or games. I would like to see them as children and not as copies of their elders always occupied with something. 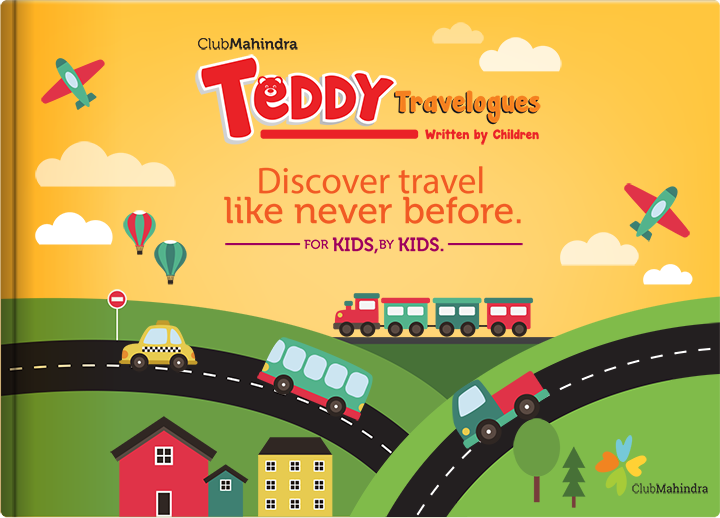 Kids see vacations very differently from adults, their expectations are much different from us and you could have an idea of these desires with Club Mahindra Teddy Travelogue an online travelogue of kids written by kids. While reading them you realizes that holidays are not meant just for fun for kids but they also learn a lot in such vacations. These stories inspires children to travel more and create a platform to showcase their unique talents. This post is part of Happy Hours Teddy Travelogue at Indiblogger. They bring so much fun to anything and everything. Love the beginning of your post. And the new look of your blog.